My attention is back on my son. The older he gets, the more I learn from him. At the age of six, he already shows an uncanny ability with pen and paper that boggles my mind. He is not a classical portrait artist or an accomplished wildlife sketch artist, but he can capture emotional expressions in simple animal cartoons like nothing I could ever try to do. He still reverses his letters when he prints and he still spells words like he is stamping out license plates, but when it comes to drawing imaginary animal friends, he is a graphic whiz. So I am not surprised that his visual field sees things through different lenses than I normally use. Last week we were at a restaurant. I ordered the seafood linguine, which came with fresh clams and mussels. He, as always, ordered the plain pasta with butter, and declared himself full after about five corkscrews. He had already crayoned as much of the children's placemat as space would allow and was getting antsy while the rest of us ate. 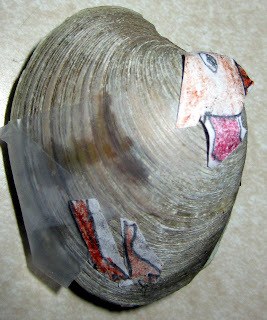 I wiped one of my clam shells clean with a napkin and gave it to him to play with. I figured he would make it talk, like a puppet, which he did... until his whole face lit up, and he announced under his breath, "I'm going to make a TURKEY!" I didn't pay much attention to that comment, but after he said that, he held the clam shell very carefully, so as not to break it, and told me any time we made eye contact that he needed to make a craft as soon as we got home. "I can't wait to make my turkey!" In my mind, I imagined him gluing googly eyes in the usual place, then making the mouth open and close as it said gobble-gobble. Maybe he would even glue on yellow or orange as a beak. The thrill of anticipation consumed him, so much that my little shy guy even stopped a patron on the way out to tell him that he was going to make a turkey when he got home. The man, surprised, smiled and said, "Good for you, buddy!" I still didn't think much of it. When we got home, the girls set about to getting ready for pajama time, and he went straight to the table with paper, scissors, crayons and glue. "Time to make my turkey!" I was relieved to have quiet and kept myself busy with everything a mom has to do (... which is, everything). Ten minutes later, he handed me his finished project. I stopped "everything" in amazement. He HAD made a turkey. Never in a million years would I have seen a turkey in that clam shell. My closed mind only saw the cliché, the usual way of looking at a clam shell. But his turkey gave me such a moment of enlightenment. The "turkey in the clam shell" is a perfect metaphor for Aspie life. So many times we see things, literally or figuratively, in space or in our mind's eye, which nobody else can possibly see... and, more importantly, which excite and delight us for the sheer realization of what we see. For my son, it was a turkey in a clam shell. For me, it is usually some realization about human nature and spirituality, or some connection between concepts which makes a short, clean, straight line in solving what looks like a complicated mess. And... nobody else sees it. It's not that we are particularly genius or important for seeing what we see, it's how meaningful it is to us, and how impossible it is to communicate it to anyone else. In my son's case, he was able to translate it into tangible space and share it. I bet that man he told in the restaurant didn't give it another thought, nor would he expect a finished product like the one above. But when my son told him, he did so with great conviction and joy. He was bubbling with glee at his creative vision. I remember having a moment like that when I was five. Out of nowhere I realized that most kids are automatically programmed to ask questions to their mothers first, not their fathers, even if their father is sitting right in front of them. It came to me when my playmate ran past her perfectly alert and capable father to ask her mother inside the house something she could very well have asked him outside. I shared my amazement with our other playmate who was waiting out there, remarking how weird I found the need for kids to run to their moms instead of their dads. I didn't realize her father would find that so offensive, particularly because I said it with the mind of an anthropologist and not one hurling insults at my friend's father, so it was a huge shock later when I was reprimanded for being rude and made to apologize to him. I insisted I didn't do anything wrong, but nothing doing... I had to apologize. It felt like much more of an insult to ME to have to apologize for such a harmless (and, to me, exciting) observation. And, when it was all done, my friend had still gone to her mother, not her father, so my apology changed nothing. Many times I find myself misunderstood, and it bothers me most when it is something that profoundly affects me -- yet fails to register with anyone else. Most of the time it isn't going to change the world, but over time, it adds up to me feeling like my ideas (about completely inane things, yes) aren't worth the effort because other people don't see them the way I see them. It has been a lifelong challenge pushing myself to try and communicate better, to be more patient in explaining what I mean, to be more forgiving when others don't see what I see... and, to cling to my vision, even when it is so much easier to just throw the clam shell away. But now I have a greater challenge. It's not about me anymore... it's about my children. It is my job to encourage them even when the rest of the world can't see the turkey in the clam shell. In fact, the world may not ever see the turkey... but don't you dare let that quench the spark inside. If it's something you know is there... then trust it is there. Stick to your convictions. Test them out for yourself, not for anybody else. Persevere in communicating them. And most importantly, don't ever deny that the turkey is there, even if nobody else can find it. Don't let others talk you out of who you are because THEY don't have YOU-Vision goggles!!! Lord... Let my little children lead me.